Boston's Theater District is small, but packed with venues for all sports of entertainments: theatrical, musical, comical, whimsical. Boston's compact Theater District, south of Boston Common, southwest of Chinatown, is lively every night. (The Orpheum Theater, near Park Street Station, is not in the Theater District and is thus farther, about 11 minutes (1/2 mile, 800 meters). Same-day half-price tickets for many Boston theater and musical performances are sold by BosTix online and at BosTix kiosks in Copley Square and Faneuil Hall Marketplace. 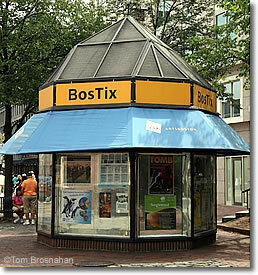 Buy same-day half-price theater tickets at the BosTix/Arts Boston kiosk at Faneuil Hall Marketplace, or in Copley Square.